Being sick while traveling is the worst. My train ride was miserable because of my sore throat. It didn’t help that everyone in my group of four had to wake up before 6 am today to make the 7:00 am train to Killarney. We got to the train station just in time, thanks to a lack of traffic at that ungodly hour, as well as our taxi driver’s willingness to drive at 80 mph on commercial roads. windbreaker. We were still slightly unsure of what we should do, and so far I was regretting our “let’s just wing it” attitude in planning the weekend trip. But we found a tourist office where a nice man recommended that we stay in a hostel that was closer to the one we originally booked, which was 3 miles away from the town center. We walked to the hostel he recommended and checked in. 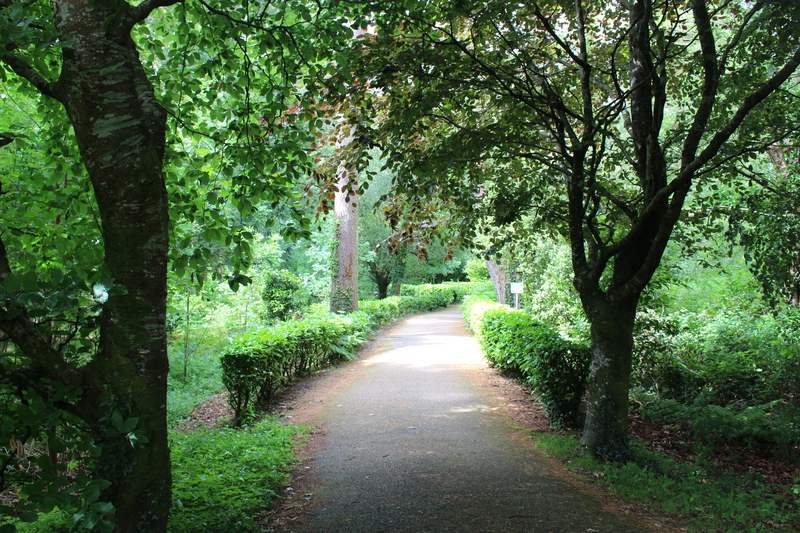 Good thing too, because there was a shuttle bus two blocks away that was able to take us to Killarney National Park. We still weren’t sure what to do when we got to the park, but it was tourist friendly, with a bunch of signposts telling us where to go. 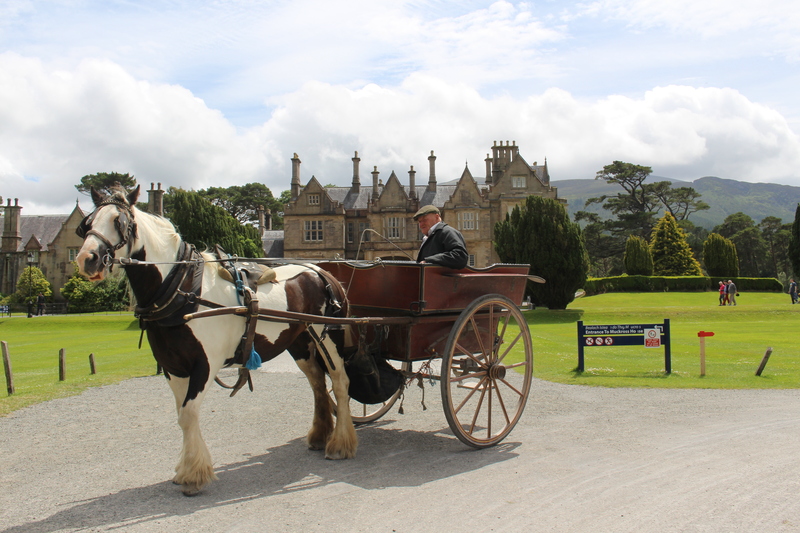 First we saw the Muckross House, which was basically just a gray rock house. We wandered over to the horse-drawn carriages because our friend wanted to take a picture with a horse, but ended up on one of the carriages bound for Torc Waterfall. Our horse’s name was Susie and she was so sweet like her owner Robert, who was an old, adorable man who sang to us on the way to the waterfall. We stopped for 20 min to see the Torc Waterfall, which was pretty, but not as impressive as Yosemite’s Bridalveil Falls. All four of us were taking pictures like maniacs during the trip, so Robert kept stopping Susie to give us good shots of the landscape. Back at the Muckross House, we hiked 1 km down to the Muckross Abbey, which ended up being an eerie stone building surrounded by graves. It had a bunch of secret passageways, doorways, stair cases, the perfect place for a hide-and-seek game but also dangerous because of the steep steps. We then walked back to the restaurant and got cake and potato leek soup. I loved my first bite of Rocky Road Biscuit, but it was so ridiculously sweet that I had to beg my friends to help me finish. It ended up being a giant struggle just to wash it down with soup. 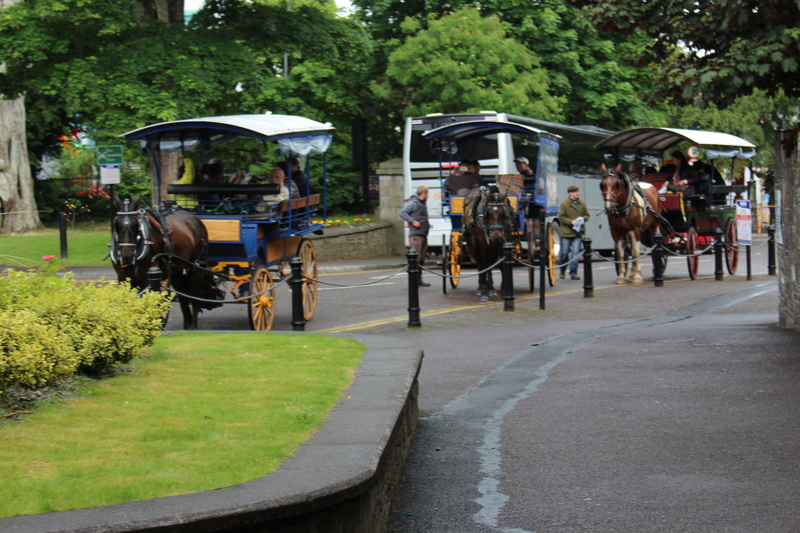 Sadly, we didn’t have time to visit the petting zoo before the last bus arrived to take us back to Killarney. After a filling seafood dinner, we returned to the hostel to relax. There were some Koreans cooking barbeque in the hostel kitchen and it smelled amazing. I guess I’m still hungry. Woke pretty early this morning, and ate free breakfast in the hostel kitchen. Turns out the Koreans cook instant ramen for breakfast. 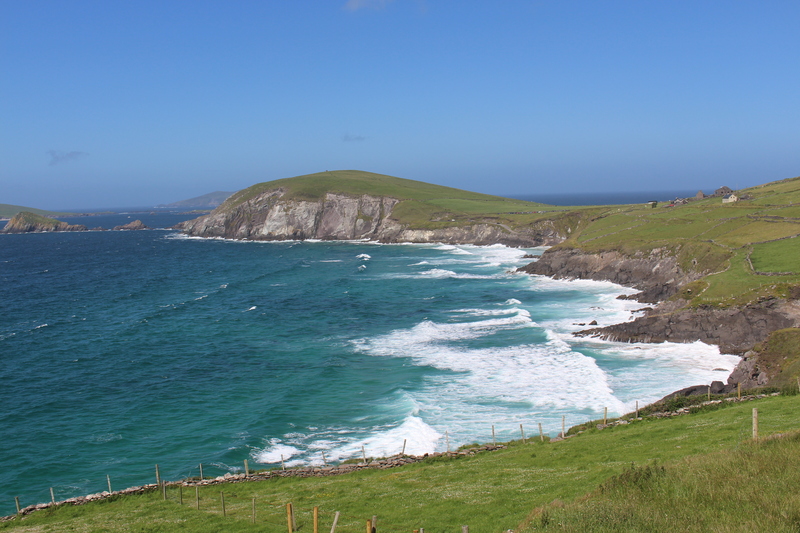 At the front desk, we bought tour tickets for Dingle Peninsula and took a stroll outside. The cathedrals and churches in Killarney are beautiful. There was a French group coming with us on the Dingle tour, and I found out from one of the girls that they were from Clermont-Ferrand, where Michelin Tires originated. The bus tour was a standard drive out to countryside. Our first stop was at Inch Beach, which was trying to repel us with its insanely strong winds. The next few stops were gorgeous views of the coastline and other islands. The water was so blue and the islands so green. 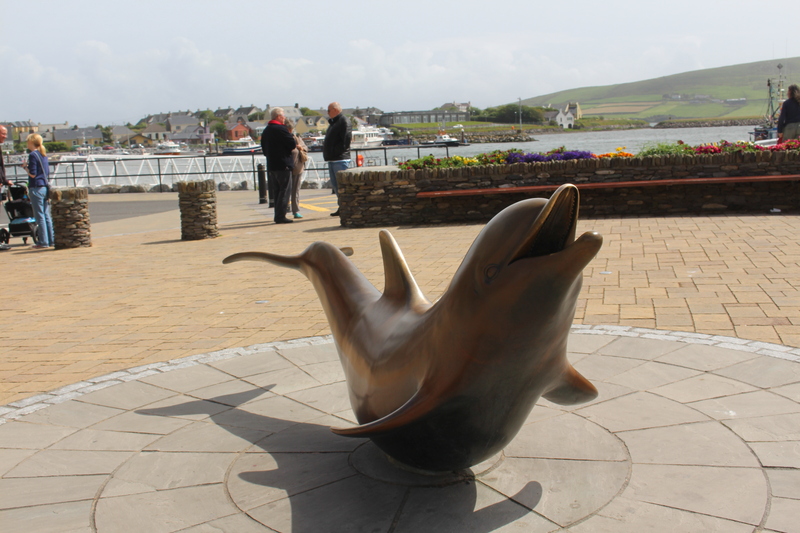 We were hungry by the time we stopped in Dingle, a quaint town famous for a nearby dwelling dolphin named Fungie who you could only see after paying for a boat tour. There was also a guy there who had a donkey and two dogs. We ate at Dingle Bay Hotel, where all of us got a mixed seafood bake that was filling but so amazing. After that we just had time to browse the gift shops and take pictures with a Fungie statue. The long ride back to Killarney made us groggy as hell. Later, while getting dinner from a sports bar in Killarney, we ran into our bus driver from earlier. He gave us the rundown of Gaelic football scoring, bashed the Ring of Kerry, then made fun of us for being tourists. Starting my second week of internships! 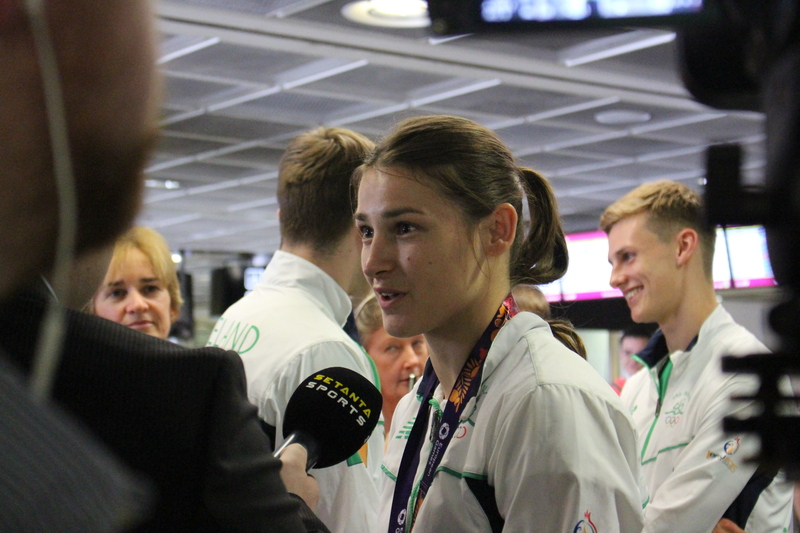 As soon as I got to the office, I took off with my supervisor to the Dublin Airport to collect some footage of European Games gold medalist celebrity boxer Katie Taylor and her teammates as they arrived home from Baku. I shot with my own camera while my supervisor interviewed her with the camcorder. Woo for being the paparazzi! 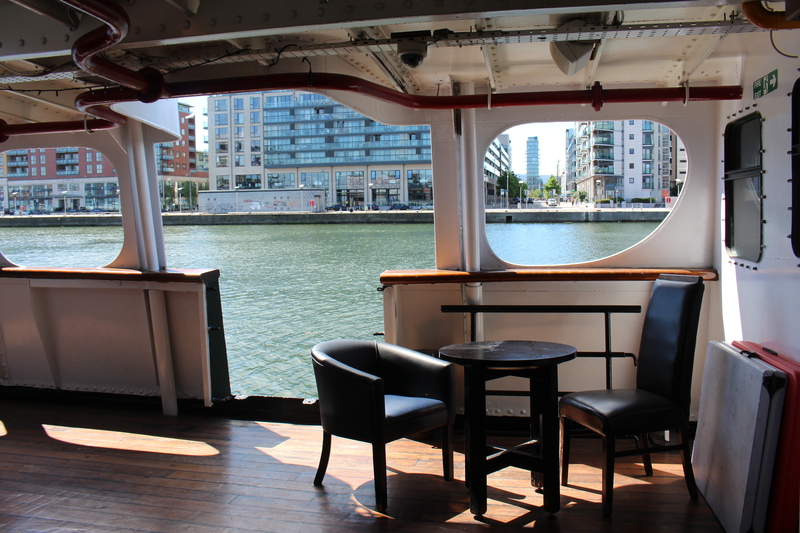 Today, we accompanied the entertainment editor to an interview with the director and a voice actor for the Oscar-nominated animated film Song of the Sea … on a boat! 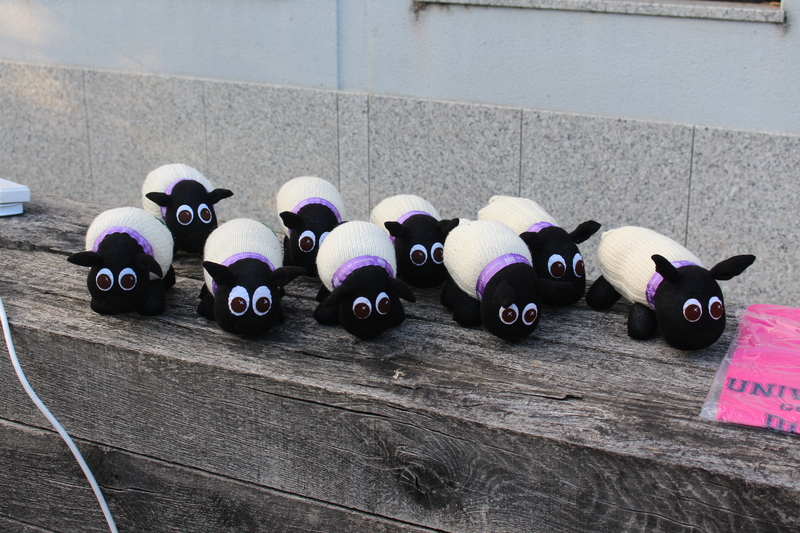 Back at home, I went to a summer singing session where a UCD music teacher taught us how to sing “I’ll tell me ma” in two-part harmony and a little bit of “Auld Triangle.” They kept giving us prizes like crystals, stuffed sheep, and t-shirts. I somehow got myself a reputation for being the resident photographer- so here is a sheep photo. This morning, the travel editor was preparing to shoot his weekly episode of Travel TV with the fashion editor and asked if one of us interns could help set up props and make some graphics for the episode. We both went downstairs to watch the videographers set up the cameras and film all the shots. After lunch, I created the graphics on the video team laptop while one of the videographers edited the show. Not a bad day! supervisor. While waiting for the taxi to take us back to the office, we ran into a police officer who still remembered us from a video shoot we did last week. Tonight was the Magic Mike XXL premiere, and the look on my supervisor’s co-editor’s face when he learned he had to interview some male strippers tonight was priceless. Woke early this morning to finish the last of my homework for an online class. After the on-campus class, I figured out how to use the printers and printed out my boarding passes for Ryanair. Java Cafe was advertising some “July fourth lunch special” but I preferred getting chicken wings from Centra. 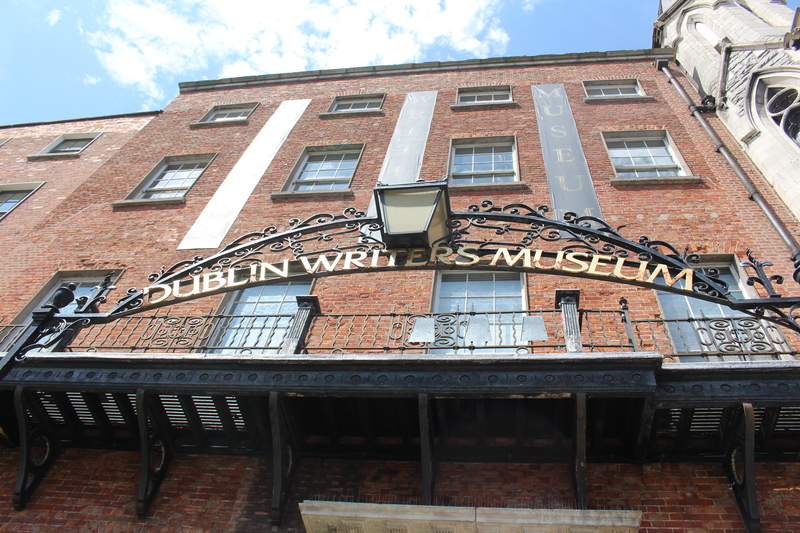 Almost everyone from my program then boarded a bus to the Irish Writer’s Museum, which was smaller than expected. We ducked out soon out of sheer exhaustion. Got myself ice cream on the way back to the 39A bus stop on O’Connell Street.